Climate deal came down to the difference between "shall" and "should." 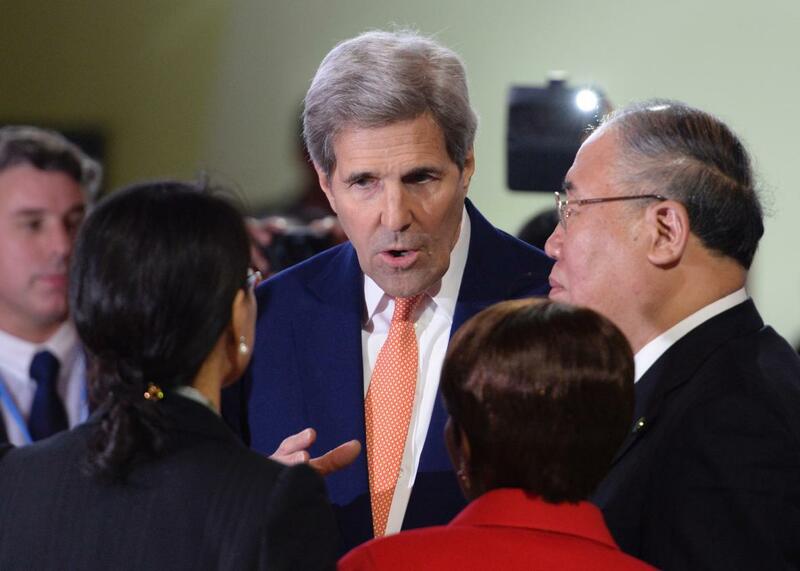 U.S. Secretary of State John Kerry speaks with China’s Special Representative on Climate Change Xie Zhenhua and delegates at the COP21 Climate Conference in Le Bourget, north of Paris, on Dec. 12, 2015. The ambitious, years-in-the-making, 195-country deal that aims to save human civilization as we know it could have been undone on Saturday by an argument over one small but consequential word: shall. A draft of the Paris climate agreement submitted to delegates on Saturday stated in one subsection that “Developed country Parties shall continue taking the lead by undertaking economy-wide absolute emission reduction targets.” Shall, as opposed to should, which had been the wording in previous drafts, implies that the agreement is legally binding. That was never going to work thanks to the fact that one of the major political parties (ahem) in a major developed country (cough) still rejects the scientific consensus on climate change. Negotiators blamed the change in wording on a typo or technical error, though some delegates were skeptical. The U.S. persuaded the French hosts to change the word back to should. One small positive outcome of the embarrassing incident was that China—which has until recently been implacably opposed to the U.S. position on climate issues—supported the U.S. stance and helped convince skeptical developing countries to accept the change. The deal came together later on Saturday. While many developing countries, particularly the small island states that are literally fighting for their survival, were hoping for a legally binding deal, the looser structure of the Paris Agreement isn’t necessarily a bad thing. Legally binding treaties can take years to ratify in national legislatures. The 1997 Kyoto Protocol didn’t enter into force until 2005 when 55 countries finally ratified it. The Clinton administration never even submitted it to the U.S. Senate, which had pre-emptively disapproved of it. Treaties also make it more likely that countries will simply drop out of the deal entirely, if they find themselves unwilling or unable to meet their binding commitments, as Canada did with Kyoto in 2011. The looser structure of the Paris Agreement counts on political pressure, signals to global energy markets, and technological improvements to induce countries to continue to make increasingly ambitious carbon reduction pledges and actually implement them. There’s no reason this can’t work if countries actually are genuinely committed to avoiding the worst impacts of climate change. That “if” is where the downside of Obama’s post-congressional foreign policy comes in. Obama’s major measures to reduce U.S. carbon emissions ahead of Paris have been done almost entirely through executive action, without congressional support. The next president will be tasked with following through on the commitments made at the summit, and while Republican candidates have been largely silent on the agreement, most of them don’t consider the climate issue a major priority. Most of them don’t even acknowledge it exists. As with the Iran deal, the Obama administration has managed to reach a surprisingly ambitious agreement without needing Congressional approval. Whether it is actually implemented is contingent on a Democrat winning the White House next year.